Finally, I have been able to borrow a camera to photograph my work. I have been making so much lately and it has been frustrating not to be able to show what I do. When I sell things I will be able to buy my own camera, but that is a while off yet. I have made necklaces and earrings, but the things I am most proud of are my wire wrapped beads. I'll show them off today. First up, an absolutely gorgeous lampworked bead by Wendy of Guru Creations. She's going to send me broke that girl, I just cannot resist her work. I wire wrapped it in 14k gold filled wire and am really thrilled with its simplicity. It looks really classy. 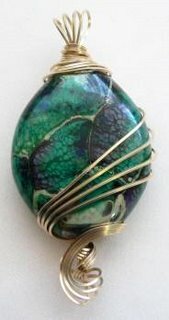 Another lampworked bead by Wendy. I'm not quite so happy with this one. I couldn't get the wire to bend enough and so, in my opinion, there is too much going on over what is already a busy bead. Oh well. It's sterling silver so I'm not just going to cut it off. I'll see if anyone bites. I do like the curl at the bottom of both these beads though. It makes them better balanced than others I've done. This is a Carnelian bead I bought over a year ago. I just loved the orange and the shape and that touch of white patterning at the top. So pretty. One of those purchases where, once you've bought it you have no idea how to use it. Finally I thought of this pattern and I think it's stunning. Simple, elegant and very special. 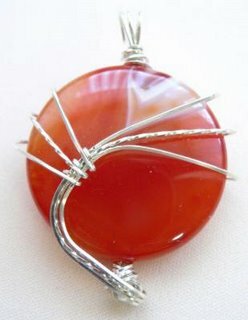 I think I will buy some carnelian beads and string it somehow. The loop at the bottom of the sterling ended up facing the wrong direction to what I intended but the design ended up better that way anyhow. 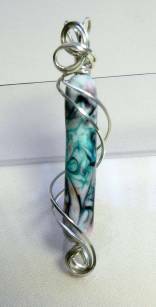 This last one is a bead by Anne Dundas. 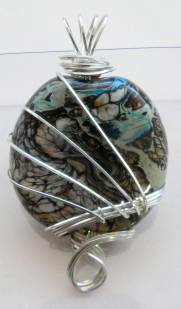 She makes beautiful lampwork beads. I have used a lot lately. This one was so much smaller than I expected it to be that I was at a loss as to what to do with it. I was quite excited to realise I could wrap it. It's not the best, but it's not too bad and it's the first one of this shape I've done. The loops are too small for my liking but that was all the wire I had left. Again, sterling silver. I'd love people's comments on these wire wrapped beads. Your work is stunning! This is exactly the kind of jewelry I enjoy wearing. I'll be back soon to go through your catalog.